In the first half of the twentieth century small Japanese farms peppered the outskirts of the city. The produce from their farms in Bigelow Gulch, Nine Mile Falls, Spokane Valley, and Latah Creek Valley prompted the formation of the Spokane Vegetable Growers Association in 1925. Formerly located at W 1109 Ide Ave., the association was essential to the economic structure of Spokane’s Japanese community. Prominent Japanese businessman, Frank Hirata, managed the association until his internment in WWII. In 1910, there were 316 Japanese farmers in Washington State, but by 1920 that number doubled as more families made the trek to a new life in America. With immigration to region increasing, concerns over Japanese influence in the U.S. grew. Exclusionary acts like Washington’s Alien Land Law restricted Japanese-immigrants from owning land. A small but vibrant farming culture remained in the greater Spokane area, despite anti-Japanese efforts. In 1913 photographer Ryosuke Akashi set out to document the lives of Japanese immigrants carving out new starts in Spokane. His book, “Japanese Businessmen and Their Enterprises,” contains photographs of the businesses owned by the region’s earliest Japanese settlers. Among these photographs were four farms owned by Japanese families. Prior to WWII, it was estimated that twenty farms in the region were owned or operated by Japanese residents. Despite a brief and unsuccessful campaign to evict several Japanese farmers from their lands on Latah Creek, Japanese farming efforts expanded as part of the war effort. Washington farming was essential to the war effort’s need for food production. As Japanese resettled in Spokane from internment camps, many took jobs as farm hands. After the war, regional Japanese farms boomed—especially small truck farms. Local post-war farmer Shozo Higashi moved to the area in 1955 and established a farm near Nine Mile Falls. Eventually he bought out the other members of the Spokane Vegetable Growers Association, and renamed it Spokane Produce. Today the company remains a wholesale distributor of produce, and is still owned by the Higashi family. Spokane Farms Use Japs from Centers: Agriculture was a crucial part of the defense industry during the war. With many eligible farm hands fighting overseas, Japanese-Americans were released from camps to assist in harvests. 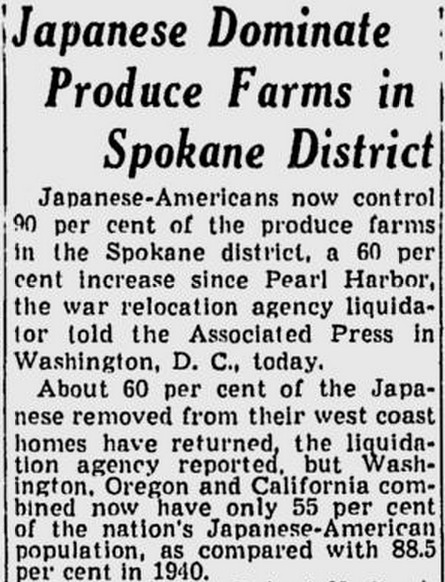 ~ Source: "Spokane Farms Use Japs from Centers." Spokane Daily Chronicle. July 3, 1943. Google News Archive. Japanese Produce Farming: By 1947, nearly 90% of the produce farmed in Spokane, was controlled by Japanese-Americans. Many of these farms were small truck farms located in Bigelow Gulch, Vinegar Flats, and the Spokane Valley. ~ Source: "Japanese Dominate Produce Farms in Spokane District." Spokane Daily Chronicle. August 20, 1947. Google News Archive. 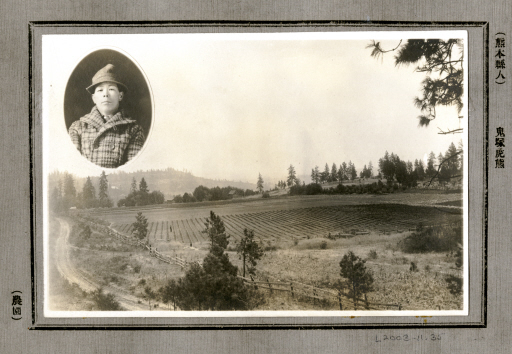 Anna Harbine, “Spokane Japanese Farms,” Spokane Historical, accessed April 24, 2019, https://spokanehistorical.org/items/show/563. Akashi, Ryosuke. "Spokane Japanese Business Men and their Enterprises" Photograph Album (L2003-11). Northwest Museum of Arts & Culture. Coe, Gordon. “Farm Comeback Noted.” Spokane Daily Chronicle. June 11, 1973. de Leon, Virginia. “Company Founder, Farm Dies.” Spokesman-Review. June 27, 2003. “Interracial Farm for Spokane Area.” Spokane Daily Chronicle. November 10, 1943. Kennedy, Tolbert H. "Racial Tensions Among Japanese in the Intermountain Northwest." Research Studies of the State College of Washington 14, no. 2 (1946): 145-50. Krause, Rose Sliger. 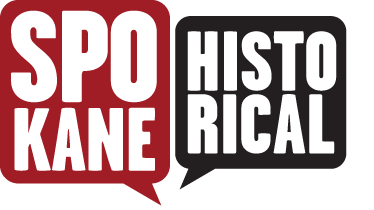 Beyond the Evacuation Zone: Japanese Evacuation and the Resettlement in Spokane, Washington. MA Thesis, Eastern Washington University, 2006. 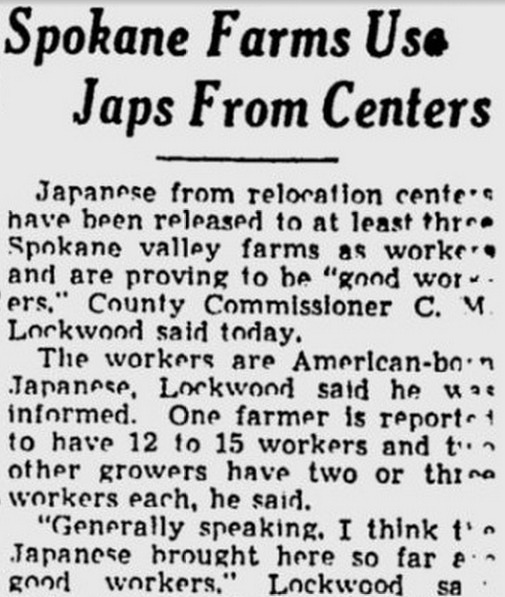 “Spokane Farms Use Japs from Centers.” Spokane Daily Chronicle. July 2, 1943. Wilbert, Deborah Ann Gallacci. “A History of the Formation of the Japanese American Community in Spokane, Washington, 1890-1941,” MA Thesis, Washington State University, 1982.